1. I haven't actually put my car rack to use yet, but the birds have! We have a nest on our side porch by the door, and the car rack makes the perfect spy location for hovering parents to watch us go in and out of the house, making sure we don't mess with their babies. Happily, our cat Willie doesn't seem to know the nest is up there. Aren't the humans perfectly marvelous creatures? Doesn't it make you double over with laughter the way they remain committed to the idea that they're the only species that feels deeply, because--what--they have words to talk about their feelings? Has it not ever occurred to them that perhaps the reason they need so many words, the reason their words constantly fail them, is that they are so much poorer at interpreting their emotions than we are, that interpretation, per se, is a step that in the dog world we just skip? 4. Speaking of dogs, I think that there are dog people in the world and there are cat people. Sure, you can love both, but it seems like all of us have a preference. As much as I love our dog, Scooter, I am definitely a cat person. Paul is more of a dog person, although he likes cats. 5. At Pierce's school, they are having a drive to collect money for the tornado victims. All the teachers have big jars with their pictures on them, and kids can put money in the jar of the teacher they MOST want to see hit in the face with a pie. Unbeknownst to me, Pierce cleaned out his Darth Vader bank and took the change to school. He deposited it all in his gym teacher's jar. He adores his gym teacher. He came home and told me about it, and all I could do was smile at a kid who's willing to donate his pocket change to a good cause and a pie in the face. I decided to contribute, and the next day he took my change and put it in the principal's jar. I can't wait to see who the winner is! Readers, are you a cat person or a dog person? Love both, but definitely a cat lady. Be sure to tell us who wins that contest. Wish I had known where the jars were yesteday. I had a ton of change with me. birds are so creative, aren't they??!! Yes, but do those birds poop on your vehicle when using the racks? They seem to poop on everything around here. Love to hear them sing but can't they take their bad habits into the woods for heaven sakes!! I love cats, I love dogs, I couldn't choose between them...now as for Reid's accountability, you just have to give him 100% for creativity! My daughter used to pop the heads off every Barbie in the house when she was young her answer when I asked why. "They look better that way" I have no idea what that meant then nor now but she is an amazing artist with a great imagination. I see a mystery writer emerging? I lived with a family of 5 cats for a number of years. I loved those cats dearly, but I am a dog-person in my soul, in my bones and in my heart. I think people can like both but prefer one. I am all for cats. They both shed / how to choose? Cats are cool ...but our dogs go everywhere with us and are so devoted to us and we to them ...so of course it is the dogs ... but shh don't tell the cat. I love that he took his money to school. He is such an amazing boy! I'm a cat person. I bet that surprises you, doesn't it? :-) I do love dogs, though, and was a dog person until I met Waddles. Then it was like the sun broke through and I understood the beauty of cats. I love that quote. I think it's true of a lot of animals. What a great young man Pierce is. I'm a cat person, although I do love dogs. Love the quote from the dog -- too true. I giggle about Reid and the match box cars. Fun shot of the bird and its new *tree*. !!! Have a lovely weekend. I had two bad experiences with cats so I'm definitely a dog person. I love that passage from the book you shared. Reid's little fibs are too cute! oh, reid! and sweet pierce! i love all animals, but a few years ago, i realized dogs hold most of my heart. Great photo! But I guess you may as well stop asking Reid who did it! I think that was nice of the teachers to do the drive for the tornado victims and how sweet of Pierce to empty his bank! 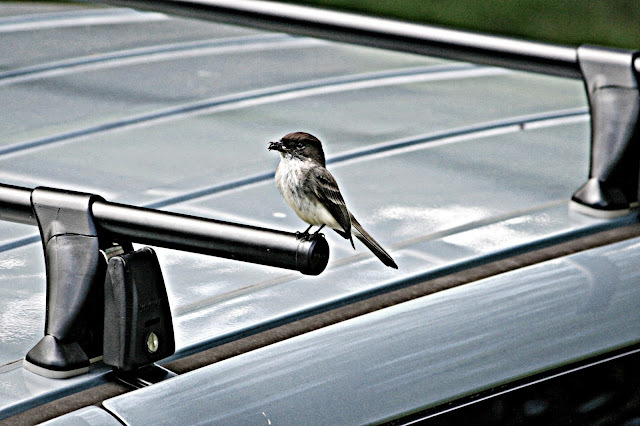 I like your new car rack and birds always find the strangest places. Yes I would say Reid needs a little work on his accountability but it's kinda funny. I am definitely a dog person but I think cats are awesome too! Oh, I would love to see that if it happens! Reid has a good imagination, and is also able to keep track of his stories! We are definitely cat people! Love that bird photo, so cute! I do love my dog, but I'd have to say I'm a cat person at heart. I really like that passage you shared from the book - so cool! Can't wait to see who wins the Contest. Hope each of you has a great weekend. Definitely a dog person, although I do love cats, too. It's wonderful that Pierce has such a generous spirit! I have to say I have always been a dog person... but don't dislike cats. I've had both cats and dogs---and definitely prefer dogs... BUT--I like cats. Neat that Pierce took his own money for the tornad victims... Love it. Funny boy with a generous heart! Cats rule, dogs drool :) That would be why I am not partial to dogs...too much drool and stinky doggie breath. That Reid is just a curious little guy so give him an A for that. I am a cat person but have neither animal. When Amy was little, her stuffed skunk Black and White was always guilty when something naughty happened! and Pierce has a heart of gold - Wonderful trait to have!! Pierce is surely a thoughtful little guy! I had outdoor cats from the time I was three until I married an allergic fella. Then we had a dog. Our daughter had indoor cats that roamed the top of the cupboards, knocking things off. I love them both, but would rather have an indoor bunny. Without a doubt I am a dog person! I am a cat person. We are dog-sitting Sammy the Weiner Dog this week and I'm on Day 2 or 3 and he's sort of getting on my nerves. Dogs are too needy for me. I'm not used to anyone following me around all the time. That said, I don't mind watching him--he is a nice change in our routine. I love that he calls your mom Cat Cat. I'm a dog person for sure but haven't had one since we've had kids. What a thoughtful thing for Pierce to do. I can't wait to see who wins.